A long belated follow up to his Oscar-winning 2006 documentary An Inconvenient Truth, An Inconvenient Sequel: Truth to Power follows former Vice President Al Gore as he continues to travel around the world, raising awareness of climate change and advocating for renewable energy sources like solar and wind, both here and in developing countries. The first film was released six years after Al Gore’s failed presidential bid and two years into Bush and Cheney’s second term, and for many people it provided their first introduction to issues of manmade climate change. This sequel arrives following last year’s election of Donald Trump, who ran on the promise of clawing back some of the environmental protections put in place by Barack Obama and has put people from the oil industry in charge of the EPA, so in many ways these issues are even more pressing now than they were back then. The first film was basically a filmed version of his PowerPoint presentation, an approach that made it feel a bit dry as an actual movie, and this sequel goes in a slightly different direction while still following a similar structure. Directors Bonni Cohen and Jon Shenk, a husband and wife team taking over from the original’s Davis Guggenheim, follow Al Gore as he visits the melting glaciers in Greenland and surveys the flooding in Florida, with the talks that he continues to give to rooms full of people around the world providing the film’s backbone. The film culminates with his trip to the Paris climate talks in 2015, showing his attempts while there to dissuade Indian Prime Minister Narendra Modi from building four hundred new coal-fired power plants in his country, and focus on renewable energy instead. But the importance of the information being presented in An Inconvenient Sequel: Truth to Power doesn’t take away from some of the shortcomings of the film itself. The environment is an issue that is near and dear to my heart, and I’m a huge proponent of phasing out fossil fuels and replacing them with renewable energy sources at a faster pace than we already are. So as someone who’s already pretty well versed in environmental causes and climate change, I didn’t find much of the information here to be new or even presented in an overly unique way. While there’s no doubt that I agree with the research being put forth, the science in the film is also kept at a pretty basic level and seems like it should be mostly common knowledge by this point. There is also a feeling that the film is preaching to the choir and won’t change as many minds as it needs to, partially because Al Gore’s somewhat self-aggrandizing nature can get a bit tiresome to watch. The film also has a tendency to focus more on criticizing easy targets, while giving a free pass to leaders like Canada’s Prime Minister Justin Trudeau, who is shown here in passing and often talks a good game when it comes to the environment, but doesn’t back up his words with much in the way of meaningful action, despite being blindly adored by the media. The best moments in the film actually involve Al Gore’s visit to Georgetown, Texas where the Republican mayor has made it a priority to run his small city entirely on renewable energy, both out of concern for the environment and also because solar has become more cost effective and offers a way to become more self-reliant and get out of the pocket of the fossil fuel industries. This suggests that the best way forward is by bringing climate change back to being seen as a non-partisan issue and chipping away at the notion that it’s only something people on the left care about. The biggest takeaway from the film is that more focus should be put on the financial benefits of renewables, which actually makes them more appealing from a conservative economic standpoint, but the oil companies won’t allow this discussion to happen because they have huge sway over the government in terms of lobbying and donations. While An Inconvenient Sequel: Truth to Power won’t likely make as any waves as the first film, it still provides a decent and slickly assembled primer on the current climate crisis, especially for audiences who are less initiated in the subject. The film not only offers a pretty revealing look at how bad things will continue to get if we don’t start changing the way we do things, but also offers some hopeful solutions as to what we can actually do to make some positive changes. 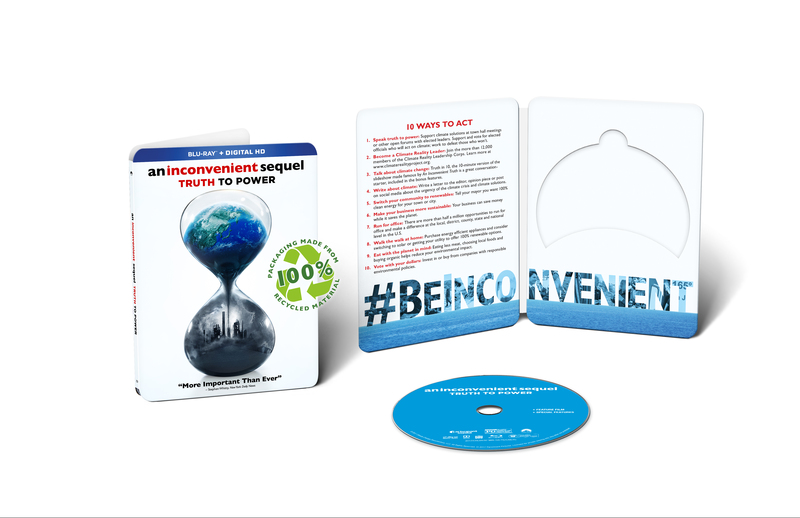 The Blu-ray also includes the extended featurette Effecting Change: Speaking Truth to Power, a fairly in depth piece that offers discussions with Al Gore and the filmmakers who talk about the making of the film while also elaborating on some of the themes that are addressed within it, as well as the short piece Truth in Ten, which shows Al Gore giving a condensed version of his presentation to a private audience on his family’s farm in Tennessee, and a lyric video for the OneRepublic song “Truth to Power.” The film comes packaged in a cardboard case made from 100% recycled material, which is a nice touch. An Inconvenient Sequel: Truth to Power is a Paramount Home Media Distribution release. It’s 97 minutes and rated PG.